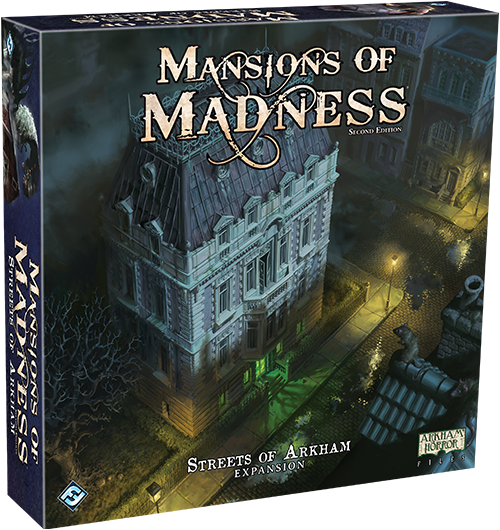 Fantasy Flight Games is excited to announce Streets of Arkham, a new expansion for Mansions of Madness: Second Edition. Three new digital scenarios build upon the Arkham Files universe with yet unseen tiles, mythos events, investigators, and cards to expand upon your investigations. The city’s façade of normalcy fails as strange happenings begin to infect key places around town. You’re likely to find odd circumstances at many areas, including the Miskatonic University, the hidden gang-run speakeasies, and the curious storefronts that populate the once quiet neighborhoods. As an invested citizen with a penchant for noticing when “odd” becomes “too odd,” you gather a team of likeminded investigators to examine these supernatural threats. It’ll take all of your wits, grit, and the occasional bit of luck to do what needs doing, but somebody has to.